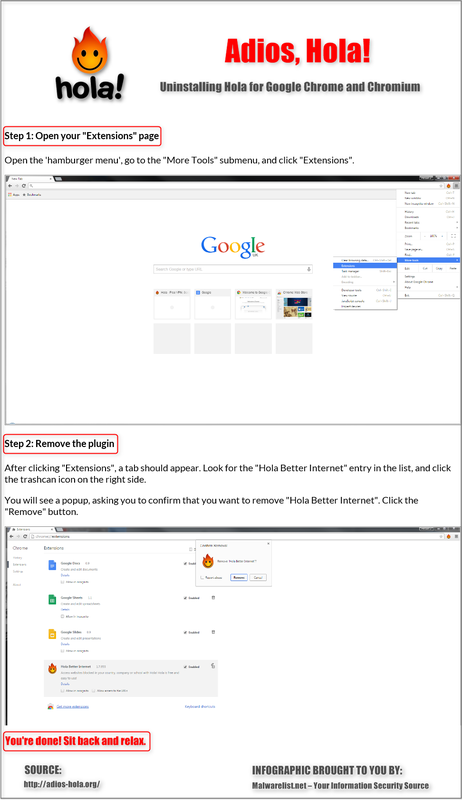 The flaws were found in the Hola Chrome extension, Windows client, Android application and Firefox add-on. Yeah this program is a sad excuse for a VPN solution. Uninstall immediately. For it’s customers signing up for this free VPN service to try and protect your communications, anonymity, and privacy; this program did the absolute opposite. If you have Hola installed, you should uninstall it right now. Infographic brought to you by Malwarelist.net – Your Information Security Source.